The second of the two-part episode, titled "Cold Blood," renewed my faith in Doctor Who and is easily my favorite episode so far. The episode picked up where the previous one, "The Hungry Earth," left off. 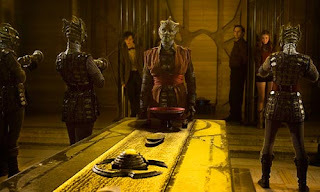 The Doctor (Matt Smith) and Dr. Nasreen Chaudry (Meera Syal) were exploring the surprisingly large underground city of the reptilian Silurians. Amy Pond (Karen Gillian) was about to be "decontaminated" and the others struggle under the prediction of their captive underground invader that one of them will kill her. This episode moved quickly as it showed that not all the Silurians were militantly evil and some were actually trying to help. Even a scene where Amy and Nasreen are brokering a peace treaty with the leader felt exciting and tense because of what was at stake. Star Trek could take a few lessons from this. Scenes where the Northover family were struggling between the desire to be "the best of humanity," and the natural desire to protect their family was touching. The Doctor was shown at his best as a negotiator and a peace-lover. Its still interesting to me how he acts more distant from the human race than he did in past regenerations. I'm not going to spoil anything, but the "Time Crack" reappears with heart-wrenching results and one major piece of foreshadowing. "Cold Blood" was clever, moving and eventful. How do you feel the fifth season of Doctor Who is going so far?